"That is the way of things… the way of the Force." Order your own copies of Way of the Force Booster Packs at your local retailer or online through our website today! It's time to fulfill your destiny! 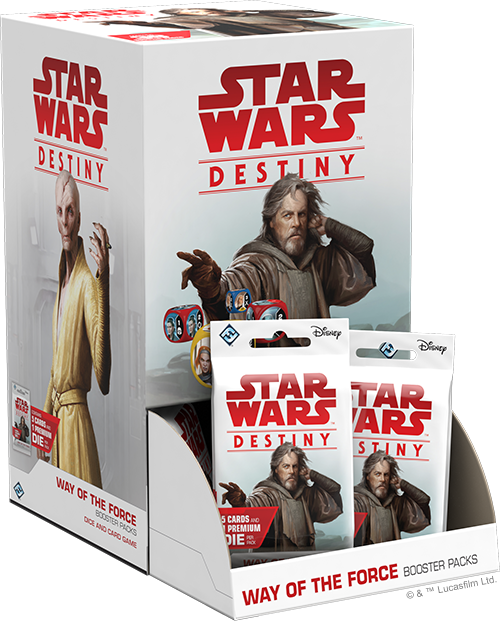 Way of the Force, a new set of boosters for Star Wars™: Destiny, featuring 160 brand-new cards, is available now in North America from your local retailer or our website. Look for European releases throughout the month of July! 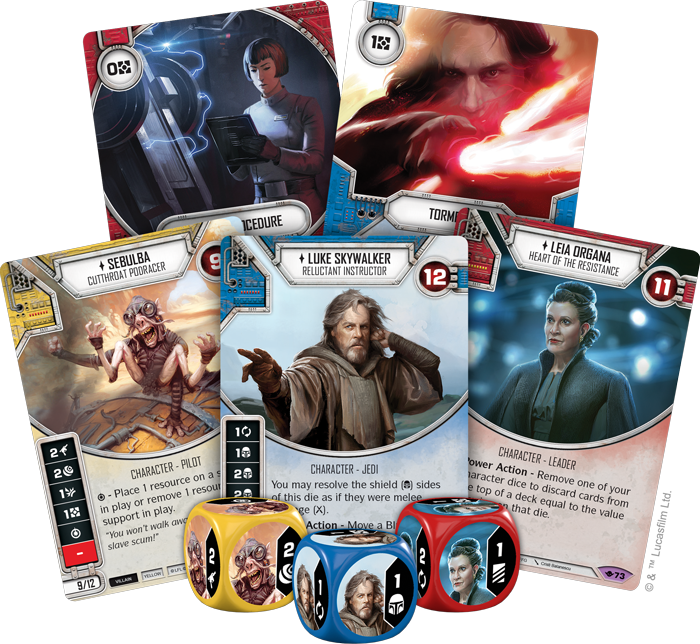 Way of the Force expands on the themes established in Legacies, with new Plot cards, ways to deal indirect damage, and a reintroduction of classic characters. With cards representing every era of the Star Wars saga, Way of the Force is the next step in your journey to fulfill your destiny! 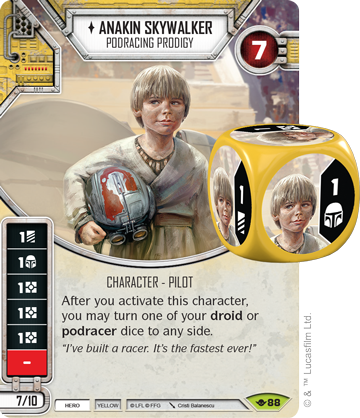 Adrenaline-pumping podracing finds its way to Star Wars: Destiny in Way of the Force! 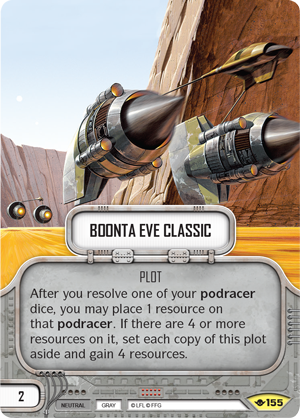 You can take on the Boonta Eve Classic (Way of the Force, 155) to try and gain a huge windfall of credits, but you’ll need a podracer to even stand a chance. 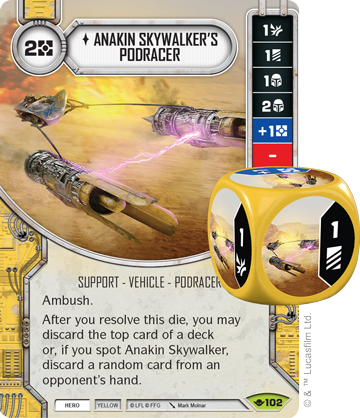 While the best racers have their own unique pods like Anakin Skywalker's Podracer (Way of the Force, 102) or Sebulba’s Podracer (Way of the Force, 50), if you have the skills, any Podracer (Way of the Force, 153) can get the job done! Of course, you have better odds if you’re fielding some of the best racers in the business. Sebulba (Way of the Force, 38) always wins, and he will take any advantage he can get to try and win the Boonta Eve Classic. 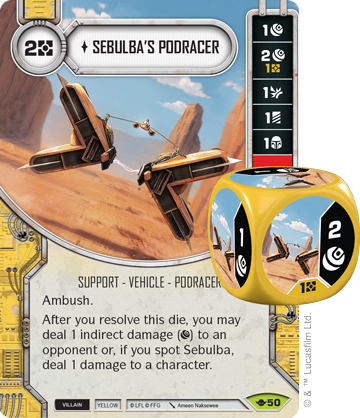 Sebulba’s ability allows him to stack resources on his podracer, quickly taking a lead in the big race. Meanwhile, Anakin Skywalker (Way of the Force, 88) is more mechanical, ensuring your podracer is showing the best die side possible. 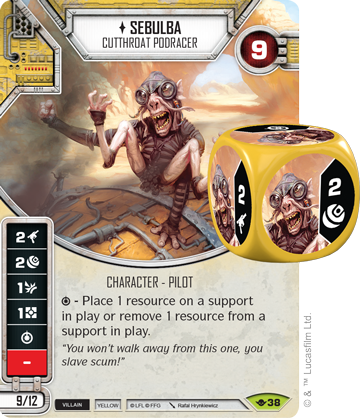 With podracing making its way into Star Wars: Destiny, your battles will never be the same! 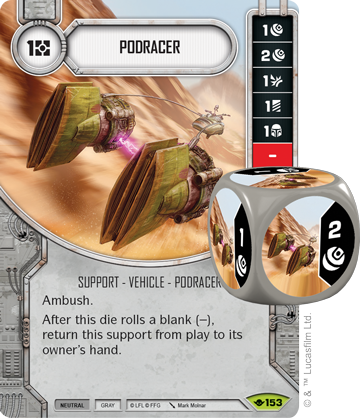 For a full preview of podracing in Way of the Force, click here! Years after Anakin Skywalker won the Boonta Eve Classic on Tatooine, a small group of heroes fought to spark a Rebellion on the planet of Lothal. 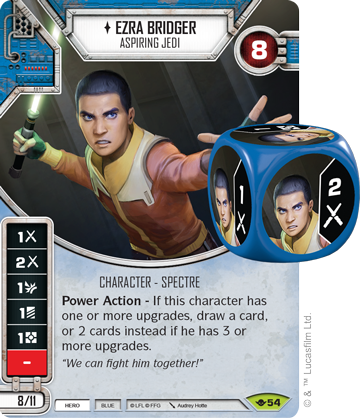 First introduced in Empire at War, the cast of Star Wars: Rebels continues to enter Star Wars: Destiny in Way of the Force! 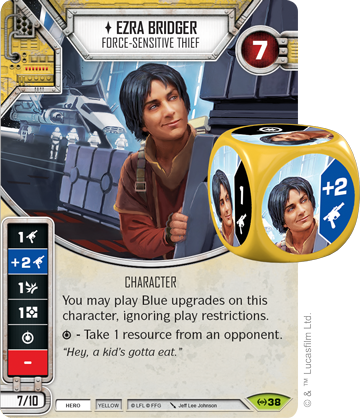 When Ezra Bridger began his journey, he was a Force-Sensitive Thief (Empire at War, 38). In Way of the Force, we see him grow and change into an Aspiring Jedi (Way of the Force, 54). Under the tutelage of Kanan Jarrus, Ezra’s understanding of the Force has grown, and the more he learns through the upgrades you equip, the more powerful he becomes. 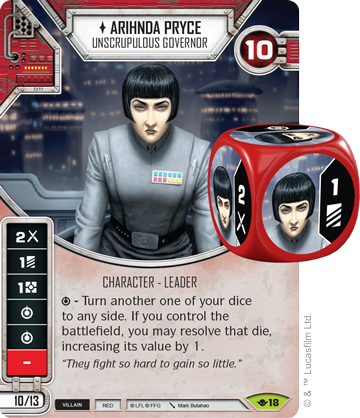 Opposing Ezra Bridger and the Spectres is Arihnda Pryce (Way of the Force, 18), the Unscrupulous Governor. A brutal military officer, Pryce’s special symbol can let you turn a die to any side, resolving it and increasing its value by one if you control the battlefield. With absolute control of your dice, Arihnda Pryce can overwhelm your opponent with brutally efficient force. For a full preview of the Star Wars: Rebels characters in Way of the Force, click here! Thirty years after the original trilogy, a new conflict is brewing between the light and the dark. Way of the Force includes characters from The Last Jedi, the latest episode in the Star Wars saga! Leia Organa (Way of the Force, 73) has gone from Princess, to Hero of the Rebellion, to the Heart of the Resistance. Rallying a new generation of heroes, Leia Organa fights in a more indirect method in Way of the Force. As a Power Action, you may remove one of your character dice to discard cards from the top of a deck equal to the value showing on that die. With this Power Action in mind, you can build a deck focused on milling your opponent’s cards, winning by emptying your opponent’s hand and deck. Opposing Leia and the Resistance is the First Order, dedicated to wiping out the new Republic. Rather than raising up those around him, the First Order’s Supreme Leader, Snoke (Way of the Force, 4), revels in the destruction of his own subordinates. This is why his Power Action allows you to deal a damage to one of your characters to resolve their character dice, increasing its value by two! This can turn your other characters into powerhouses, as any of their character dice suddenly becomes more terrifying. 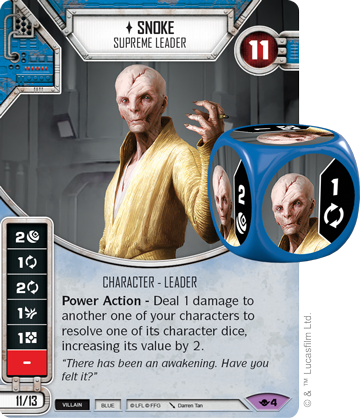 If you're willing to damage your own characters, Snoke can provide power from pain. 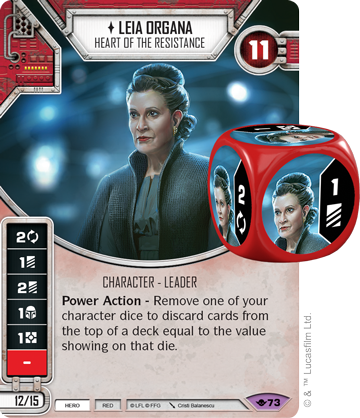 For a full preview of characters from The Last Jedi in Way of the Force, click here! Way of the Force has arrived, and with it, characters representing every era of Star Wars. Whether you’re looking to race podracers with Anakin Skywalker, fight for Lothal with Ezra Bridger, or join the war between the Resistance and the First Order, Way of the Force has something for you. Fulfill your destiny today! It is time to fulfill your destiny. Way of the Force (SWD12) is available now from your local retailer or our website!